Welcome to the Diamond Dove Home Page. Wilmer J. Miller PhD. - Ringneck Doves. January 1, 2006: China has become the oldest bird we have ever raised. She and her mate King both hatched out January 1985 making her 21 years old this month. They were both offspring of our four original birds, three which were purchased and one which was found in our yard. King, like his father was a large diamond, and since King and China never had any offspring, King remained the largest bird we had over the next twenty years. Unfortunately his father escaped outside before having any other male offspring. King was really the king of the roost and the other birds respected him because of his size. He also was very loud and always had the last word in any conversation - with another diamond or a human. He learned a six note coo we taught him and that became his standard call. China had an ardent "lover" over the years by the name of Nesty who we believed hatched out sometime in 1987. His first mate was killed in an accident in 1988 and that is when their "affair" began. He did bow coos for China at any opportunity and was always politely ignored by China. King, of course did not like Nesty's approaches and often threatened to attack him. Then we purchased Nesty a new mate which we called Silver, and he settled down with her and parented a long line of offspring. But even after the years passed, Nesty never tired of doing bow coos for China. And China continued to ignore him and King would indicated his displeasure. Around the year 2001, King became partially paralyzed in his legs and while he could still fly well, he could only shuffle along on the ground and could no longer perch. That finally ended up with King sleeping in his nest at night with China along side him. Sometimes he flew to his nest but more and more often I had to place him in the nest before the lights went out. To provide variety in their life, I started bringing King and China and later Nesty and Silver to my desk in the evening when the cage lights went out and they stayed there eating bread and seed, or just dozing off under the warm desk lamp. 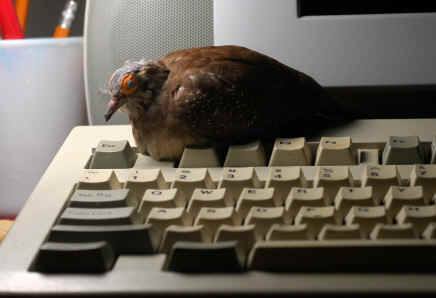 This got to be such a habit that if the lights went out and I had not brought the four birds to my desk, that China would leave her open age, fly to my desk and land square in the middle of my keyboard indicating that I needed to bring the other three birds to the desk. We always left their cage door open as we soon learned that if there was trouble China would fly out looking for help. As King aged, he had trouble getting out of the nest in the morning, and China would fly out to my desk wanting me to take him out of the nest and place him on the cage floor so he could eat. There were also two times when King landed in the water cup and could not get out. I was out the first time and China was waiting on my desk when I came back. King was cold and near death as he had been in the water for some time and the apartment was cold. But a long warm water bath brought him back to life. He did the same thing in the summer but then his body heat was warm enough to heat the water up to his body temperature so he enjoyed a warm bath and there were no apparent ill effects except to worry poor China. One time when King got in trouble I was in the bathroom with another dove and the door was closed. I heard some scratching at the door and did not pay any attention. Then there was a loud thud. I opened the door and China was on the carpet. Apparently she gave up scratching when there was no response and then flew into the door to make a louder noise. That really made me feel bad. I knew she had a problem with King and picked her up and went back to her cage and once again found him in the water cup. Despite the fact that Nesty was a few years younger than King and China, he seemed to become frail at the same time King did. His legs were weak and if he stumbled, he would fall on his back and could not get up. If this happened (Nesty's and Silver's cage was alongside King's and China's cage) , China would immediately fly looking for me. Nesty's mate never seemed to have the intelligence needed to recognize that I could provide help. And as time passed, China seemed to make herself responsible not just for King, but the other two birds as well, and when they were all on my desk, she would sit on the telephone (when she was not eating) so she was above the other three birds and could easily see they were ok.
Then in July 2005, King came down with an infection of his cloaca and could no longer pass stools. At the time I did not realize that I probably could have used a small syringe and pushed a lubricating jelly inside the vent and he might have pushed out the mass himself. I saw a vet use this procedure on a ringneck about a month later. I looked at King's death as a real tragedy as he had been able to live twenty and a half years without any real problems, and he definitely should have been able to go on a few more years. He certainly seemed to enjoy his life with the company of China, Nesty, and Silver, even though his legs were mostly paralyzed. 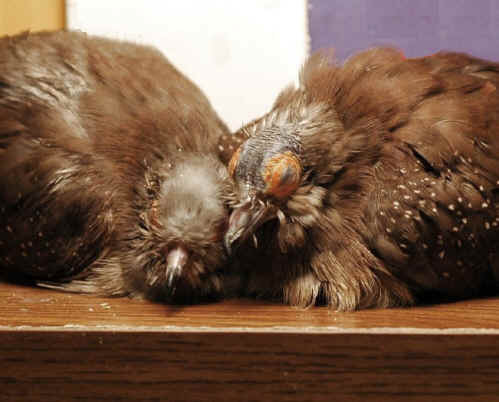 After King's death, I placed the three remaining birds in one cage and they all snuggled together at night. Nesty still did a few bow coos for China and she seemed to enjoy his expression of affection. Then while I was away on vacation in September 2005, I received a call from my niece and she said that Nesty had died. He just passed away one night. That left China and Silver and as I write this both are still living. China still walks very well, but she is no longer a strong flyer. She looks old, having lost all the feathers on her head and some on her neck. She has a crooked beak which has to be trimmed weekly. She also has a tumor under her right wing which either she or I remove every few weeks And she now has stools that adhere to her vent and have to be cleaned off daily. Lately I have applied Desitin to her vent and that seems to prevent any irritation. When she wants something to be fixed she walks right up to me and demands attention. Once I was playing chess with my daughter and I tried to push her aside, she immediately came back and knocked over a few chess pieces! That really made me feel bad. I quickly found she needed her vent treated and then she went back to sleep on the telephone under the lamp as we continued our game. China and Silver live together and are never far from each other. If China moves too far off, Silver calls her. If it is cold Silver always wants to snuggle with China and she usually accommodates her. In the past China always seemed to think that humans were there for her use, but she lately she has been showing slight signs of affection. She will fluff up and sit in the palm of my hand for some time and look quite content. But when Silver calls, she wants to leave. Of the two China as definitely the most dominant and the most responsible for the well being of the other. I don't know how long Silver will live and once she dies I think China will feel there is little purpose to go on living. Several years ago I had an old hen that lost her mate and she lived another two years spending her time with me when I was home. Perhaps China will find that I am enough companionship for her and live several more years. I do not know the record age for diamond doves, but China at 21 years is the oldest diamond dove I have every heard of. In the early morning of January 9, 2006, Silver fell from her nest, became cold, and died. It was dark and China could not see well enough to fly down and find her or come and look for me. Once Silver was gone, China spent most of her time with me. I encouraged one of my eight year old males, Peep, to come over to my desk and visit with China. He was most cooperative and did that often, sometimes bringing his mate, India, and other times coming alone. He would just sit near China for long periods of time. Eventually, when he came over, China expressed her appreciation by flicking her wings. (There were no bow coos - it was just an expression of friendship). But when Peep was not there China decided her place was on the corner of my keyboard and would stay there all evening or any time I was home except to drink and eat. I was concerned about her sleeping alone on a perch because of the cold temperatures in the apartment in January, so eventually I put a heating pad in the bottom of a box and each night put the box beside my bed. I arranged the stiff wire of the heating pad so she could perch on it, yet be very close to the surface of the pad. In late January I decided to buy another male diamond in the hope that he would take care of China as in the past we have had young males attach themselves to old hens that had lost their mates and provide the love and support that was needed. But on February 9, 2006, I had to take a day long trip to the next state with my niece to help her move out of her apartment. I debated taking China with me and finally decided against it thinking the trip would be too stressful for her. When I returned home late that afternoon she was dead. China's companion-to-be arrived in the mail two weeks later. To me China was an eye opener as to how complex the mind of a little diamond dove can be. We never noticed anything special about her for her first 15 years of her life except that she always kept her feathers in perfect condition and she never allowed the other males to mate with her although she did consider Nesty to be a real friend. But during the last five years she became very special as she began to care for her mate as well as Nesty and Silver. And it was during this time she used her exceptional intelligence to communicate with me to help her take care of the other birds as well as herself. If something was wrong she always found a way to tell me about it. China died at an age of 21 years and 1 month.